U nicorn foods, unlike unicorns, are not mythical. The multi-colored and oft-glittered creations are nearly impossible to avoid these days, unless you've barricaded yourself away from social media. There is almost no food that has been spared from "unicornification" -- or the act of dying food into multiple pastel colors -- including cheesecake, fudge, lattes, cocktails… hell, even ramen. As of last week, the ~magic~ officially breached the mainstream with the debut of Starbucks' Unicorn Frappuccino. Whether this is a good or bad thing depends on your tolerance for food trends. While they might feel nascent, unicorn foods have been prancing around the internet since at least 2012 when Instructables user Kristy Therrien transformed a basic sugar cookie recipe into something she dubbed (and eventually trademarked as) "unicorn poop." The cookies were colorful, sparkly, and shaped to resemble, well, the excrement of everyone's favorite one-horned animal. While the cookies had their moment of virality, it wasn't until 2016 that the trend truly gained footing -- all thanks to a piece of toast. Food stylist Adeline Waugh, who runs the popular health-food Instagram @vibrantandpure, posted a photo of a slice of bread topped with swirls of soft purple, millennial pink, sea green, and yellow cream cheese, calling it "watercolor toast." "I never intended to make something called 'unicorn toast,'" says Waugh. She had been messing around with beet juice to make a number of pink foods and wondered if she could use other foods to organically create various pastel colors. "After naturally dying cream cheese and painting it on some toast, I posted it, not really sure what it was I had created," Waugh adds. It wasn't until a few of her followers pointed out that the creation evoked the colors typically associated with unicorns (for whatever reason) that the name was born. Now at over 4.8 million tagged posts on Instagram, #unicorn has taken over as the "it" trend of the moment. Whether this is a good or bad thing depends on your tolerance for food trends. Despite its saccharine cookie origins, it's important to note that unicornification has always had to do with appearance and not taste -- there is no cohesive "unicorn flavor." And unlike most viral foods that capitalize on gluttony (lookin' at you, #cheesepull), unicorn foods have mostly remained popular amongst the health-food subset. The softer, pastel colors are typically derived from natural substances, often hype-y superfoods, in lieu of artificial food dyes, explains Kat Odell, a food writer who is working on a cookbook called Unicorn Food, due out next year. On her @unicornfoods Instagram, Odell makes everything from pastel pancakes to raw ice cream bars with chromatic striations of health foods from around the world. She'll use algae, like spirulina and Blue Majik, to create blues and greens; beet juice for pink; turmeric, an anti-inflammatory spice frequently used in South Asian cooking, for yellow; and purple shiso, a Japanese herb commonly used in pickling and as a sashimi accompaniment. The End, Brooklyn's latest hip health cafe, makes its baby-blue "Healing Unicorn Latte" with steamed coconut milk, maqui berries (an antioxidant found in South America), E3Live (a blue-green algae), and pale sprinkles made from plant-based powders. The palette is the biggest distinction between the concurrent rise of unicorn and rainbow foods, which brought us the rainbow bagel, rainbow grilled cheese, and (sigh) the rainbow burger. While both trends are aesthetic color splatters, unicorn foods use softer hues. "Rainbow food is very strictly ROYGBIV rainbow; unicorn food is more pastels, pinks, yellows, purples, and light blues," says Waugh. Rainbow foods are much more vibrant -- colors that are difficult to achieve without the use of artificial dyes. Which isn't to say that all unicorn foods are only made from Gwyneth Paltrow-approved powders. 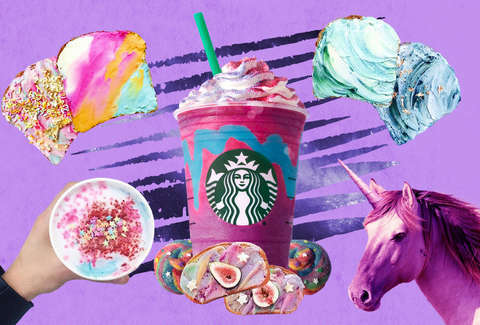 Look no further than Starbucks' unnaturally pink-and-blue, mango-flavored Unicorn Frappuccino, which briefly took over everyone's Instagram feed for the five days it was available, to see that the trend is starting to rely on artificial ingredients more heavily. A quick Google search will reveal unicorn macarons, cakes, and donuts that swap spirulina for food dyes. "The unicorn of it all is just marketing." A spokesperson for Starbucks says that the chain was inspired by the "fun, spirited, and colorful unicorn-themed food and drinks that have been trending in social media." Plenty of people are not happy (including the baristas, for their own reasons) with how the coffee giant decided to capture the health-food zeitgeist in a sugary drink -- the antithesis of foamy algae-based lattes. "A lot of my friends contacted me super angry on my behalf the day the drink was announced," says Waugh. "People were wondering if I was involved with Starbucks' new creation or if they had ripped me off. While it is super-similar to my idea, it's nothing like my creations. The [Frappuccino] is loaded with sugar and BS. It'd be super-easy to create unicorn food that's sugary and full of dyes -- to create it naturally and without sugar is what I felt made my unicorn toast pretty cool." Odell echoes that sentiment: "That drink is not my thing. It's all artificial color and flavor and filled with sugar. The unicorn of it all is just marketing." Still, any backlash aside, the styling appears to have an enduring appeal -- and not just in food. The rise of unicorn toast and lattes has been parallel with that of unicorn beauty trends, which include everything from pastel eyebrows, "holographic" lip gloss, and glittery, painted hair. It's a no-brainer as to why this has taken off in more than one interest area: It's perfect, visually appealing Instagram fodder. "As silly as it may sound, we live in an Instagram world where pretty pictures sell," says Odell. It also doesn't hurt that there is "magic associated with unicorns in general," she adds. "I think there has to be room for some frivolous and impractical fun (and escapism) with food, and that is what [unicorn foods offer]," says Waugh. But perhaps the appeal of unicorn foods is best summed up by Madeleine Murphy, one of the owners of The End, in an interview with Well+Good. "Unicorns are a majestic, mystical archetype that represents peace, joy, and opening up to the infinite possibilities inside of you." It's unlikely that drinking a pale-pink latte will open up your "infinite possibilities" chakra, but in a world where aesthetics will always outweigh taste, unicorn foods will continue to rule your social feeds for the foreseeable future. As long as it Instagrams well, people will buy into it. For now, we're waiting for the inevitable day when Dunkin' Donuts sells unicorn donuts that poop out a sparkly pastel rainbow cream. Because after all, America runs on Dunkin' and food trends. Khushbu Shah is the senior unicorn food editor at Thrillist and is made up of 30% glitter. Follow her mythical adventures @khushandoj.